A client introduced me to this recipe last year, and I liked it much more than I expected to. Don’t let the name deceive you: These are not very much like fruitcake (I am not a fan). 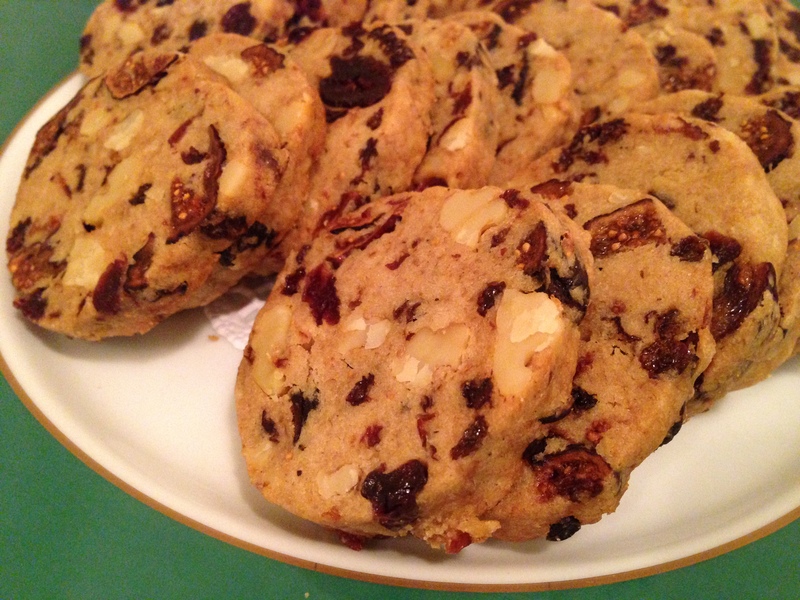 They are buttery and nutty, and the dried fruits have a hint of cognac flavor. Snip off the hard stems of the figs with scissors or a small knife, and coarsely chop the figs. In a medium bowl, combine the figs, currants, cherries, honey, cognac, lemon juice, pecans, and a pinch of salt. Cover with plastic wrap and allow to sit overnight at room temperature. In the bowl of an electric mixer fitted with a paddle attachment, cream the butter, cloves, superfine sugar, and brown sugar on medium speed until smooth, about 3 minutes. With the mixer on low speed, add the egg and mix until incorporated. With the mixer still on low, slowly add the flour and ¼ teaspoon salt just until combined. Don’t overmix! Add the fruits and nuts, including any liquid in the bowl. Divide the dough in half and place each half on the long edge of a 12-inch-by-18-inch piece of parchment or waxed paper. Roll each half into a log, 1½- to 1¾ inches thick, making an 18-inch-long roll. Refrigerate the dough for several hours, or until firm. With a small, sharp knife, cut the logs into ½-inch-thick slices. Place the slices about a half-inch apart on ungreased sheet pans and bake for 15 to 20 minutes, until lightly golden. 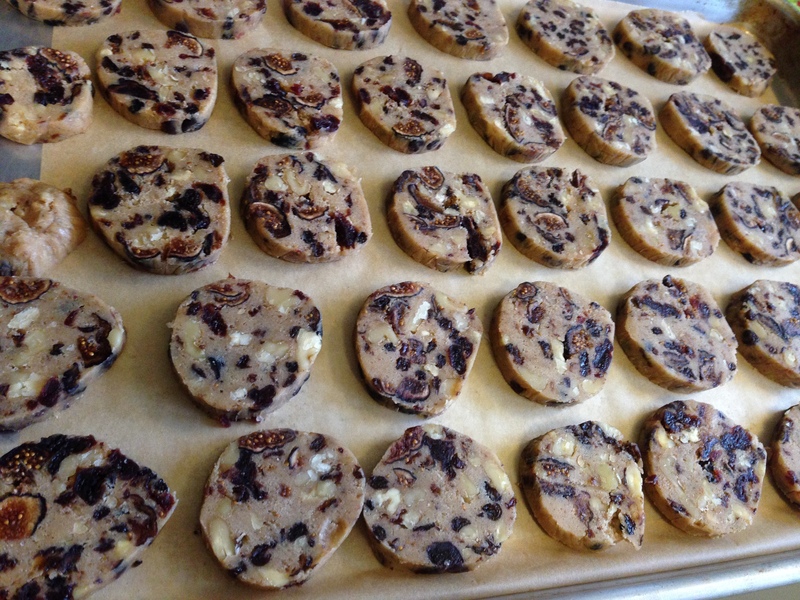 Recipe adapted from Ina Garten’s Fruitcake Cookies. This entry was posted in Desserts, Recipes and tagged Baking, Fruit. Bookmark the permalink.